If you thought moving across the country or state was tough, preparing for an international move poses a whole new set of challenges. It doesn’t have to be difficult, though. It’s a common misconception that moving is hard, but if you hire the right moving company, even an international move can be a breeze. First, you need to consider the moving cost, and there are a few factors you need to consider. The most significant portion of an international move is transportation. There are many moving companies that offer air and sea transportation and transport container services for international moves. If not, they can help you locate expert services to get you where you’re going. Packing your entire home or apartment for an international move, or unpacking upon arrival, is a significant undertaking. Many people choose to utilize a moving company’s packing services, which are an additional cost, but well worth the investment. If you have the money in your budget for packing services, we highly recommend them. Your goods and possessions will be packed properly and safely for the duration of the trip. With an international move, you have to consider customs and foreign country policy. Some items simply cannot travel with you. In that case, you’ll need storage services for the time being. Most moving companies also offer storage at an additional charge. Here, your items will be safe in a secure facility with around the clock security in place. All of these factors, depending on your choices, will help determine the total cost. 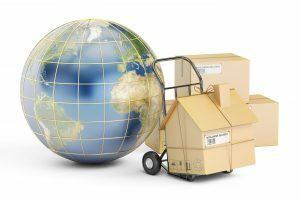 When you work with an experienced moving company, planning for an international move is easier. Contact Green Van Lines for international moving services year-round. You can reach us at 888-770-4733!